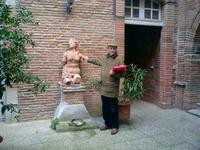 Americans in Toulouse are frequently arranging these historical walking tours lead by Gilbert. I've been on a few and it is is always interesting, even if it is on the local cemetary, or just looking at some old houses. Gilbert is a historian who knows his stuff, like the dates and names of apparently everything and everyone who was reasonably important within the last 1000 years or so in Toulouse. Where most people just walk down the street without thinking much about it, he seems to have a lot to say about every other house. Here he dragged us into a backyard of a house where a well-known manufacturer of statues was living. The morning was spent in the St.Cyprien quarter, close to where we live. Since it is on the left bank of the river, away from the rest of the city, that is where they first placed a hospital, so they could drag people over there who were suffering from the plague. And it was cheap land for an assortment of different monasteries and convents. hi Flemming! could you please update the ait url on the following page? Hello Web Admin, I noticed that your On-Page SEO is is mnsiisg a few factors, for one you do not use all three H tags in your post, also I notice that you are not using bold or italics properly in your SEO optimization. On-Page SEO means more now than ever since the new Google update: Panda. No longer are backlinks and simply pinging or sending out a RSS feed the key to getting Google PageRank or Alexa Rankings, You now NEED On-Page SEO. So what is good On-Page SEO?First your keyword must appear in the title.Then it must appear in the URL.You have to optimize your keyword and make sure that it has a nice keyword density of 3-5% in your article with relevant LSI (Latent Semantic Indexing). Then you should spread all H1,H2,H3 tags in your article.Your Keyword should appear in your first paragraph and in the last sentence of the page. You should have relevant usage of Bold and italics of your keyword.There should be one internal link to a page on your blog and you should have one image with an alt tag that has your keyword .wait there's even more Now what if i told you there was a simple WordPress plugin that does all the On-Page SEO, and automatically for you? That's right AUTOMATICALLY, just watch this 4minute video for more information at. Shoot, so that's that one suosppes. 2004-09-07 21:44: What was it that Hitler didn't know?